There aren't too many artists out there - even in the traditionally subversive world of street art - who, having not even made their art show debut until past the age of 40, rapidly meet with the meteoric success of their works selling for tens of thousands of dollars and, high-profile collaborations with celebrities, all while they are simultaneously accused of being a fraud or hoax. But of course, they aren't Mr. Brainwash. The French-born, now Los Angeles-based, street artist extraordinaire who, it seems, almost everyone continues to have a strong opinion on. This is the man described by his mentor, the legendary Banksy, as "a force of nature" and "a phenomenon", although not "in a good way". He is also the curious character who first came to wider attention in the Banksy-directed 2010 film, Exit Through the Gift Shop - the then seller of vintage clothes whose connections with the household-name Bristolian were seen by some observers as suspiciously close. If there's one charge that certainly can't be levelled at Mr. Brainwash by his massed ranks of critics, it is of being a slouch with his marketing. Despite being far from the reclusive figure that Banksy continues to represent, the man born in 1966 Thierry Guetta, has provoked questions since his first public emergence - not least among which has been, "does he even exist?" Of course, such a question wouldn't be aimed at the flesh-and-blood man who raised so many eyebrows in Exit Through the Gift Shop. After all, he cut such a haphazard, clumsy and comical figure that few believed his could possibly be the hand behind his signature works, which sit somewhere in the aesthetic spectrum between Andy Warhol's colourful prints and Banksy's monochromatic stencils. Indeed, in common with many celebrated artists, Guetta is thought to entrust studio assistants with the creation of much of his work, which incorporates splashes of colour around both historical and recent motifs of known figures, ranging from Albert Einstein, Marilyn Monroe and Charlie Chaplin to Madonna, Kate Moss and Michael Jackson. Banksy's "biggest work of art"? Or Banksy himself? For some, however, Mr. Brainwash has proved a little too successful, too quickly. They suggest that his whole story could be an elaborate hoax by Banksy and Shepard Fairey, the American street artist responsible for the OBEY street wear label. His keen self-marketer perhaps showing, Mr. Brainwash himself has sometimes been coy about the suggestions, declaring: "OBEY is about brainwashing. Banksy is about brainwashing. So I used M.B.W. - I am Mr. Brainwash." To uncover the truth of the story - or at least, the closest that we will ever get to it - one has to go back much further, to the artist's birth in the Garges-les-Gonesse area of Paris. His relocation to Los Angeles did not come on the back of his explosion to artistic fame, but instead when he was 15, following the death of his mother. His father and several siblings joined him on this journey, and after about a year as a pupil at Fairfax High School, he dropped out and began organising Hollywood events. The picture that subsequently emerges of the young Guetta on the basis of what is reliably known about him is not of the idiosyncratic, even spectacularly naive artist depicted in Exit Through the Gift Shop, but instead of a savvy businessman selling vintage garments across Los Angeles, New York and Miami. Indeed, it emerged in late 2014 that the artist actually owns an extensive real estate portfolio in Los Angeles; potentially shedding considerable light on how he was able to fund the art making that powered his steep rise to prominence. Fast-forward to 1999, and on a return visit to his homeland, Guetta was to make a momentous discovery - his cousin was the infamous urban artist, Space Invader. With an avid interest in filming even the most seemingly mundane aspects of his own life, Guetta began to document the by-night exploits of Invader and contemporaries like Fairey and the mysterious Zevs. Inevitably, he was to come into contact with Banksy, whose insistence that Guetta turn his resulting hundreds of hours of footage into a film met with unimpressive results. Reflecting that Guetta "maybe wasn't really a filmmaker", the Bristolian took charge of the project himself, suggesting to the man "with mental problems who happened to have a camera": "Why don't you try your hand at some street art?" It was an idea that he may never have expected Guetta to take so seriously - or so swiftly convert into such a real overnight success. Since then, bountiful acclaim, awards and massive sales have come Mr. Brainwash's way, all while he has declared about his contribution to street art: "I don't bring anything. I'm just following my heart. I even sign my name with a little heart. I'm not here to judge myself, or to judge anybody. What I want to do is give love, and bring positive messages. My messages in art are that life is beautiful, love is the answer, and never ever give up." 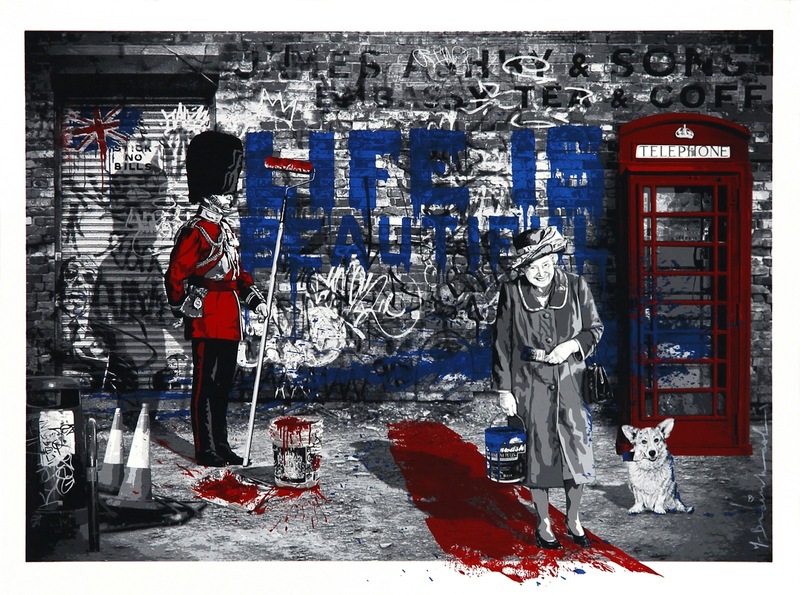 Fact or fiction, Addicted Art Gallery loves Mr. Brainwash and life really is beautiful!